You might have already found out that this is the online battle for the attention of the year. Ever since Instagram introduced its Snapchat-ish feature: Stories, people started arguing about whether will Snapchat kicks the bucket soon or will it only motivate the owners to create something even bigger. I’ve got a disclaimer for you guys. In our office at Bannersnack, there is a battle too. Robert, my colleague, is a big fan of Instagram – call it InstaFan! On the other side of this arena, is me. Snapchat is my favorite app, the one that never gets deleted from my phone. Even though we are on different sides of this story, we both can see advantages and disadvantages of both apps and the potential they have. So, in this article I will try to introduce you to both these extraordinary apps and I’ll help you understand the unique differences and advantages of both of them, that will hopefully guide you in determining which is more suitable for your business or client and whether it is profitable for you or not to invest your time in them. Snapchat is an image messaging and multimedia app launched in 2011 by three Stanford students: Evan Spiegel, Bobby Murphy and Reggie Brown. Its strength comes from its ephemeral feature that allows users to send videos and pictures that will self-destruct after a few seconds of a person viewing them. You can also chat, see the content of some major global publications like CNN of National Geographic through Discover and post content on something that’s called “My Story”. During the last few years, the app has seen an unprecedented growth, quickly becoming one of the millennials’ favorite app. Snapchat has over 150 million daily active users, passing Twitter which has under 140 million users interacting with the service on a daily basis. The app offers many opportunities of which marketers can take advantage from. One of those and the one we’ll be analyzing today is “My Story” or Snapchat Stories. This feature gives users the chance of posting content, photo or video, creating a constantly-updating 24-hour feed which friends can access whenever and how many times they want in 24 hours. In order to personalize the content and add a touch of your or your brand’s identity, you can use a few tricks, some of which I mentioned earlier. There are the Lenses, which are real-time special effects and sounds. You can access them by tapping on a face in Camera mode. After that, you can swipe through Lenses until you find one you like while following the prompts that appear like “Open your mouth” or “Raise your eyebrows”. Then you can take the video or photo like you would normally do. The other ones: filters, stickers, doodles, text and personalized emojis are props you can add after you’ve got your snap. You can access filters by simply swiping left or right. If you want to add more than one filter to your snap, simply hold tap on your screen while swiping with your other hand. You can add stickers, doodle and add text from the three icons on the right. What else you can do is save your stories to Memories. Then, you can post them whenever you want. Or, you can post photos or videos from your library, but these will have a white frame around them and a timestamp to differentiate from the native snaps. One of the biggest advantages of Snapchat is that you can create real-time content, which is what people expect and want from brands nowadays. People are attracted by the overall casualness of the app. This is why brands and marketers should adopt a more authentic strategy when it comes to Snapchat. There are a few ways in which you can use Snapchat Stories in order to promote your brand or client. Snapchat is a great real-time social media marketing tool and you should take advantage of that by providing access to live events like product launches, behind-the-scenes tours, exclusive parties and so on and so forth.You can transform your account into a private content delivery platform. Get your followers used to the idea that they can receive special content that they cannot see on other platforms like sneak-peaks from a runway show or private interviews with celebrities. For example, Michael Kors used Snapchat to debut one of his collections even before it hit the runway. People love engaging with brands, how cool is it when KFC answers back to one your snaps? VERY. That’s why you should try getting to know your audience and then provide promo codes, contests and discounts for them. It’s an easy way to create a two-way communication between consumers and the brand. Another way in which you can take advantage of the Stories on Snapchat is by partnering with influencers or celebrities. These famous people are a great way to build awareness of your brand by mixing their communities with yours. 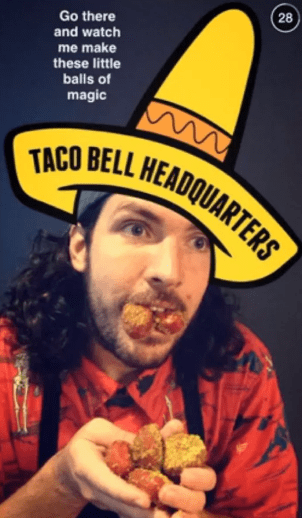 Also, there are some famous Snapchatters like Shonduras that can create some great video content based on his creativity. Whatever you choose to do on Snapchat, don’t forget to add some fun to your snaps by doodling, adding stickers or writing on them. You can also take advantage of the Geofilters. These are personalized filters that you can use in order to spice-up your snaps. There are two types of geofilters. On-Demand Geofilters which are pretty cheap and Sponsored Geofilters which can cost thousands of dollars. Instagram is an online mobile content-sharing and social networking app that lets users take pictures and videos and share them on the app as well as on Facebook, Twitter, Tumblr or Flickr. ”Instagram is a fun and quirky way to share your life with friends through a series of pictures.” via their personal blog. Instagram was launched in 2010 as a free mobile app by Kevin Systrom and Mike Krieger. One of its distinct features was that photos had to have a square shape, reminding users but the oh-so-much-fun Kodak times. Instagram grew really fast,from 90 million active users in January 2013 to more than 400 million active users in September 2015, showing people all over the world, including marketers, that this isn’t an app you should ignore. This feature lets users post content that disappears after 24 hours giving it an ephemeral characteristic. You can create a story by tapping on the plus button that you can find on the top-left side of the home screen or swipe left in your feed. The tap the circle button to take photos or videos and then start adding filters (the pinkish one is my personal favorite), text or drawings. As you’ll see, if you hit the pen icon you can find three types of pens, of which one makes your drawing look like a neon sign, a feature I’ve never seen before in a photo editing app. After editing your piece of content, tap the checkmark to add it to your ‘Stories’ and voila! You’re done! In order to navigate through one’s story, simply tap on its profile photo and then tap the left side to rewind, swipe left to advance to the next person’s story or tap and hold to pause a slideshow. You can also send a message to a user directly from the story, but unlike the typical posts on Instagram, you cannot react to content through likes or public comments. One of Instagram Stories’ biggest advantage is that there is already a community to which to deliver content to, unlike Snapchat where you have to create your audience first and then start posting content. Another one is that while in Snapchat there is no way of posting links (unless you send them as messages), on Instagram you can easily send users to your Bio from where they can access a link. 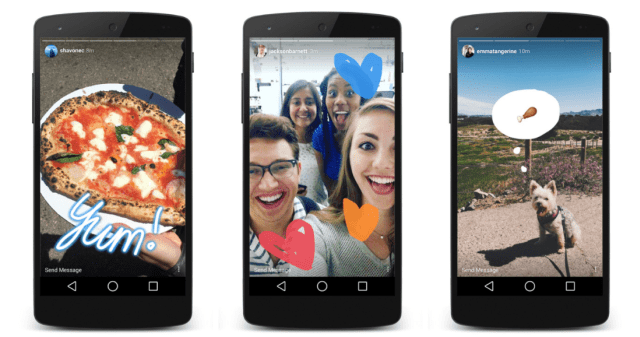 Just like Snapchat Stories, Instagram Stories are a great opportunity to share a different kind of content than you already do on your Instagram feed or other social networks. You can use the stories to let your followers know about limited-time offers that expire at the end of the 24-hours. The ephemeral nature of the story incites a sense of urgency for your customers and potential sale leads. If they know that you post offers from time to time, they’re more likely to follow you all the time. You can ask them to feedback about your products or services and how I said above, you can redirect them to a link located in the Bio. Because on Instagram, you already have communities formed, you can benefit from the communities of some well-known influencers and plan collaborations with them. Instagram Stories offer people a more unfiltered view of what’s behind the beautifully edited photos on your feed. Don’t be afraid of sharing raw glimpses (of course, with your clients’ approval) of what happens behind the curtains of a business. Even though I’m in #TeamSnapchat, I gotta say this is one powerful feature. Instagram did really good in adopting this real-time opportunity and integrating into the app. 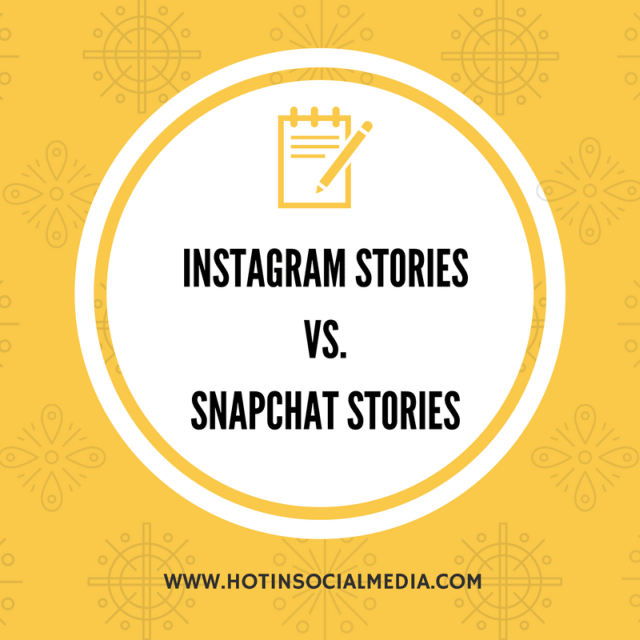 As you can see, Instagram Stories vs Snapchat Stories are pretty much the same things, except…they’re not! Each of them has advantages and disadvantages, you only need to figure out what better suits your brand and future plans. Below you can find a useful Instagram Stories vs Snapchat Stories Infographic made by One Productions. Now it’s your turn to analyze both of these platforms and see which might be a better fit for your business. Let me know which one you choose and why in the comments section and I’ll make sure to come back with an answer.